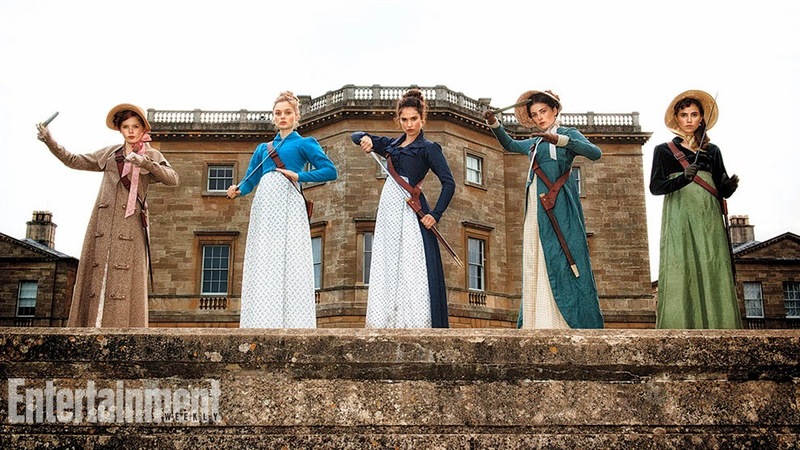 The movie Pride and Prejudice and Zombies: trailer, clips, photos, soundtrack, news and much more! Those flies are in the possesion of but one truly enviable talent: the talent to detect dead flash! Sam Riley is Mr. Darcy. The film will hit theaters on February 5, 2016. The old one-eyed woman (portrayed by Lena Headey, who’s actually still young) does know how to use a sword, doesn’t she? But I doubt she would win in a fair fight against the younger woman (Lily James). Those old pistols would not help much against hungry zombies… It would take way too long to reload… Knifes and swords would offer better protection! Release date: February 5, 2016. The film is directed by Burr Steers. It will be released on February 5, 2016. Two lovers on top a pile of corpses ready to slay more zombies together: how romantic! Romance, action, and zombies, and the whole thing in a period setting: did they get here the ultimate combination? The movie Pride and Prejudice and Zombies is set to hit theaters on February 5, 2016. Judging from the trailer the movie adaptation won’t be as exciting as the novel it’s based on. But well, there are still zombies. So I’ll go see the film anyway, lol! Besides Lily James and Sam Riley, the cast also includes Bella Heathcote, Lena Headey, Douglas Booth, Jack Huston, Matt Smith, Charles Dance, Suki Waterhouse, Ellie Bamber, Millie Brady, Jess Radomska, Emma Greenwell, and Aisling Loftus. The film will open in theaters on February 5, 2016. The film is starring Ellie Bamber as Lydia, Bella Heathcote as Jane, Lilly James as Elizabeth, Millie Brady as Mary, and Suki Waterhouse as Kitty. What a shame if such lovely women would turn into zombies! The release of the movie Pride and Prejudice and Zombies is set to February 5, 2016. Dead or undead, you don’t mess with the Bennet sisters! From left to right you may recognize Ellie Bamber as Lydia, Bella Heathcote as Jane, Lilly James as Elizabeth, Millie Brady as Mary, and Suki Waterhouse as Kitty. The film has yet to get an official release date. But it should hit theaters sometimes in 2015.